Mary Whyte is an American watercolor artist receiving international recognition for her watercolor paintings of contemporary realism and portraiture. In 2016 the Portrait Society of America chose Mary Whyte as the recipient of the Society’s Gold Medal. The Gold Medal is the highest honor awarded by the Portrait Society with past recipients including iconic artists such as Andrew Wyeth, Jamie Wyeth, and Nelson Shanks. Whyte has been awarded the South Carolina Arts Commission’s prestigious Elizabeth O’Neill Verner Award, the highest honor for an artist given by the state of South Carolina. Mary Whyte presents her watercolor paintings in museum exhibitions throughout the United States and internationally. In the United States, the groundbreaking exhibition Working South was featured on CBS Sunday Morning. The exhibition of 50 works depicted blue-collar workers in industries vanishing throughout the south, with the exhibition traveling to museums throughout the southern United States. Whyte’s works exhibiting internationally include the China and Foreign Countries International Watercolour Summit at the Nanning Art Gallery in Nanning, China, in which Mary was one of ten watercolor artists of the world invited, and The World Watermedia Exposition in Thailand. 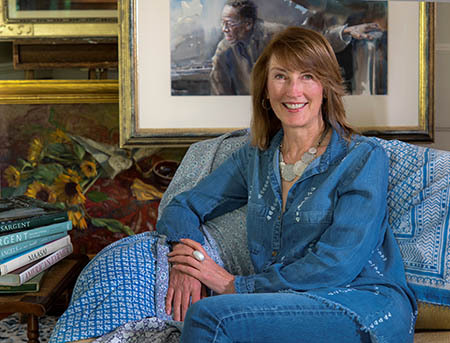 Mary teaches watercolor classes around the world and is the author of five nonfiction books published about her life, work, and artist instruction. A biography written about Mary titled, More Than A Likeness, The Enduring Art of Mary Whyte, written by art curator and historian, Martha R. Severens, has also been celebrated in museum exhibitions. For more information on acquiring available works, or for more information on upcoming museum exhibitions, events, and current news, please contact Sharon Crawford.